VAC-U-MAX, a manufacturer of heavy-duty industrial vacuums and vacuum systems, has introduced its updated Model 1020 Continuous Duty Industrial Vacuum. 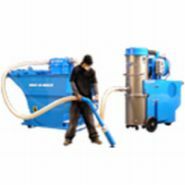 The VAC-U-MAX Model 1020 features a powerful positive displacement pump designed specifically for high volume recovery of up to 5 tons per hour. It is also used in the recovery of heavy materials including steel shot, foundry sand, metal powders, sludges and other materials of similar nature. It is available in either 10 or 15 horsepower and its continuous duty vacuum producer makes this vacuum able to meet even the toughest challenge.